A shopping trip to my local thrifting and consignment shops this week produced the ingredients to this easy, vintage junk vignette recipe. Ingredient number one was this vintage fall paint by number scene for $6. I loved its vibrant color. Ingredient number two was the very rustic, chippy little bench or stool. A steal at $2. Ingredient number three was an old beat up tool box for $4.50. The next step was cutting the paint by number to fit the underside of the tool box lid. I ended up cutting some of bottom of the painting but the sides fit almost perfectly. I did not glue or tape it in. It fits in snugly. Then I added ingredients four and five, gourds and raffia. I stacked my new bench on top of a bench that I already had, and set up the display in my main floor vintage laundry room. 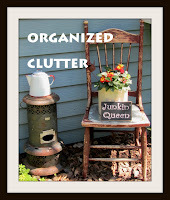 That's how easy it is to decorate for fall with vintage items! I would have bought that stool....I love them! Your display is darling...really, we do decorate similarly! That was a great idea putting the painting in the top... it is such a beautiful decoration! Wonderful finds, Carlene...and I love how you put them all together! This came out great. Love it. Love that chippy little bench. Oh, I love the paint by number! It fits the box perfectly, so it was meant to be. The little pumpkins round out the vignette, and the bench was a steal at only $2!! So cute! Such vibrant and beautiful colors! Love it...looks great!! What a great find that little rusty chippy bench was. Carlene, you always find the best stuff!!! Love this vignette! I love that fall painting and would have snapped it up in a moment! I doubt that I would have displayed it as beautifully as you did though! I love how you combined those things to create this cute fall look. You are just so clever Carlene. Putting that painting inside the lid was very smart and it made a perfect Fall decoration. Now everyone, including this blogger, will be looking for PBN painting and a rusty tool box. I likely have the rusty tool box, so half-way there. I don't know why I didn't see this last year, Carlene, but it's TOO cute! Pinning it! You have some really fun ideas here!! I especially love the pumpkins inthe cups, and the painting in the tool box!! Thanks for sharing! !